I've been wanting to do a Muddy Buddy race since I found out about them probably 5 years ago, I just never found someone else who was my size and wanted to do it as well. the reason your teammate needs to be your same size is because you actually share a bike... Muddy Buddy is a race where there is a team of two people with one bike between them. The person riding the bike starts out riding (about 1 mile) drops the bike in a "transition" area and completes and obstacle (wall climb, balance beem, etc.) Once they have completed the obstacle they start running to the next transition area... in the meantime, their teammate started running, got to transition area, completed the obstacle and finds the bike (a very time consuming endeavor as we discovered) and starts riding, once they make it to the next obstacle they hand the bike off to their teammate who starts riding and then they complete the obstacle and start running... you keep switching like this till the end of the race where you have to CRAWL through a mudpit to reach the finish line! One thing I will say about MB is that they keep it fun by giving you absolutely no information... we knew when to pick up our packets... the only information in the packet about the race was NOTHING! It was an envelope with our numbers in it, that's it. Course Map was posted on the website, but with a big note "not to scale" so we didn't really have a chance to strategize. They keep the obstacles a secret and you don't even know what time your wave starts (or what # wave you are in) until you get there in the am. CRAZY! Oh, and there is also a costume contest! 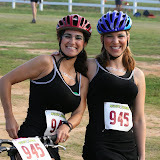 My friend Christine came up with a great idea to go as Women, dressed as men, dress as women... We came up with the team name "Supercrossed" because of the cross dressing aspect and the fact that the bike and run are all cross country/mountain biking (i.e. cyclo-cross). Michelle and I spent countless minutes on our costume and ended up with what we thought would do the job... come race morning we realized we just looked like "tarts" and we doubted if anyone would get the super crossed concept... oh well! We ended up finishing 5th in our division which was fast enough to get a medal. We don't have pictures of the awards ceremony yet, but I should be able to post them soon. I don't have the map, but it honestly didn't help that much. From what I heard it was on part of the 24 hours of adrenaline course. If it's a question of who bikes/runs first, keep in mind the person who bikes first gets a break waiting for the bike after the obstacle, whereas the first runner is pretty much nonstop through the entire course. Have fun! !